Zero is the child of the Goddess Rhinne, Transcendent of Time. Zero was created from Rhinne's tears to free her powers from the Black Mage, and to be her successor. Until Zero finishes the storyline, they cannot get experience from monsters in Maple World, and have to kill monsters and do quests in Mirror World to level up. After the Black Mage figured out Rhinne's plan, he told his commander, Will, to split Zero into two to reduce Zero's power, and to trap them in the Mirror World. The result of this was creating Alpha, a male, and Beta, a female. Will sealed Beta in the Umbra Temple, a temple created by Rhinne to help out Zero and was in ruins after the separation, and brainwashed Alpha into being one of his Shadow Knights. Alpha, referred to as Nine, was watched by the Shadow Knights, and they used him to fight Darklings, shadow monsters. Alpha became suspicious of the Shadow Knights and their plans to keep him in Shadowvale, and he finds that he is right to be suspicious upon discovering a girl identical to him in the Umbra Temple. The next day, the Shadow Knights set out to destroy the Umbra Temple and the girl, and Alpha went after them, defeating them with ease, but being defeated by Will, who accidentally destroys Beta's seal. Alpha and Beta reconnect, restoring the Umbra Temple and their power. 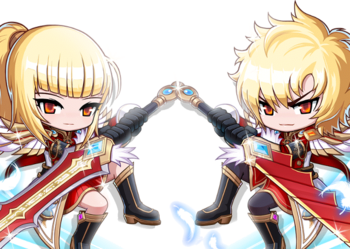 Alpha and Beta are later told by Pietta, the Umbra Temple's Record Keeper, that they are trapped in Mirror World and need to find a way to stay at full power whenever they go to Maple World. This page was last edited on 15 March 2014, at 23:54.